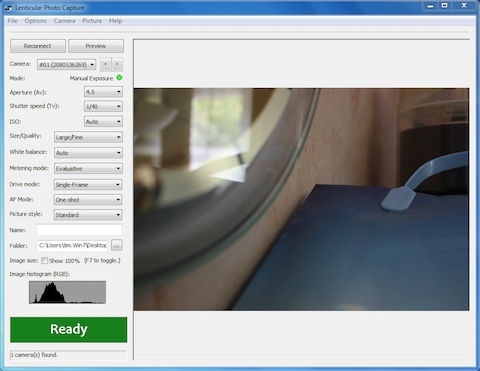 Lenticular Photo Capture program is designed to control the digital cameras connected to the computer via USB. (Only Canon DSLRs are supported for now.) It controls the cameras as they capture the individual frames and downloads them to the computer and to the Lenticular Photo Processor program; but it could also be used without the Lenticular Photo Processor tool. Within this program you can control the parameters of all the cameras at the same time, like Aperture, Shutter Speed, ISO, Resolution of the images, White Balance right from your computer, give names and numbers automatically to the frames to load them into the Lenticular Photo Processor program automatically in the right order for processing and save the frames to hard drive of computer directly. Please note: the program needs the latest shared libraries from Microsoft. You may need to download and install them. Demo version of Lenticular Photo Capture (Download 4.3 MB) supports only greyscale images.